Scott Kelly and Mikhail Kornienko, returning from nearly a fully year in space this week, will have to wait for a well-deserved holiday as scientists were eager to work with the freshly returned crew members to asses their health after spending 340 days in orbit – setting a record for the longest mission to the International Space Station. 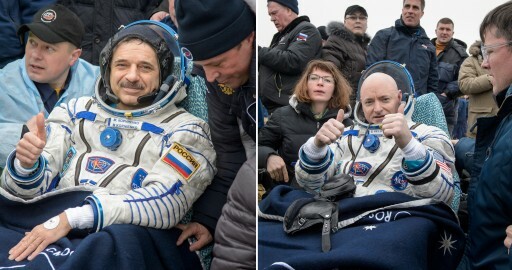 Kelly and Kornienko made a safe parachute-assisted landing on the snow-covered steppes of Kazakhstan in the early hours on Wednesday, accompanied by their Soyuz commander Sergei Volkov, following a multi-hour return from the orbiting complex where they lived for the past 11 months and made 5,440 laps around Planet Earth. Though they completed extensive experiments before their flights and at regular intervals when in space, the two were anxiously awaited back at their home bases to continue a packed scientific program, collecting data on their state after an extended mission. 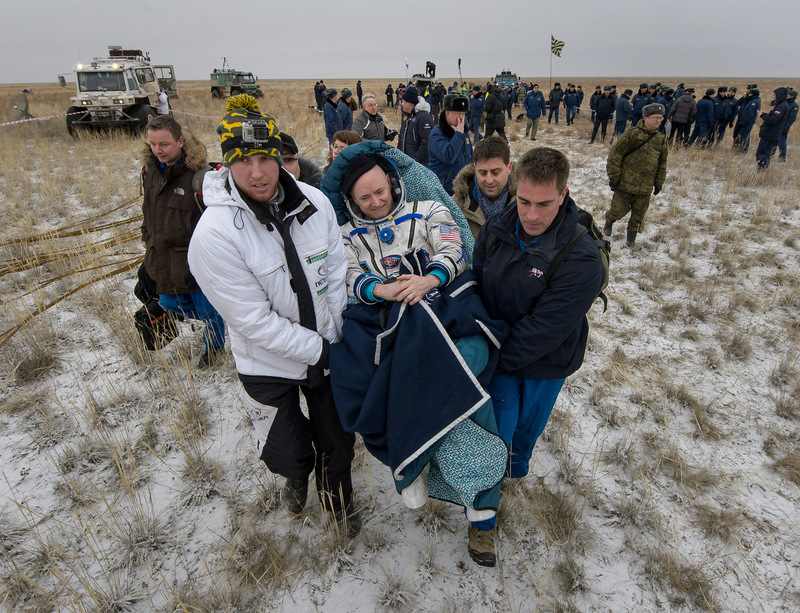 Touching down in the frigid Kazakh steppe, both Kornienko and Kelly appeared to be in good physical and mental condition when being helped out of the confines of their Soyuz spacecraft, chatting with recovery forces and joking of being ready to go up again. With their Year In Space behind them, the two crew members only had a brief break seated outside of their spacecraft since every passing minute afforded their bodies some opportunity of re-acclimation to 1G and scientists wanted to learn about their condition immediately upon their return from weightlessness. 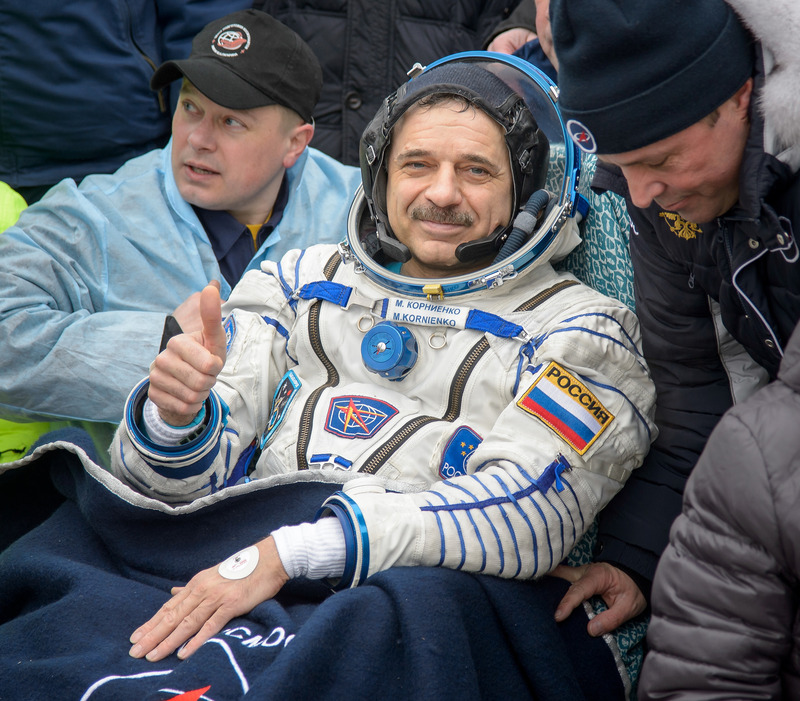 To capture this vital data immediately after touchdown, the two crew members had to go through a 75-minute experiment session dedicated to the Field Test, performed inside the Medical Tent set up next to the landed Soyuz capsule. 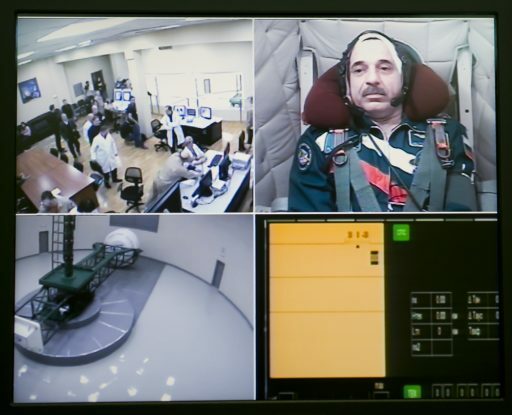 Of particular importance for the one-year crew members, the Field Test has been designed to assess the complexity, severity, and duration of physiological changes that have noticeable effects on a crew member’s health when returning to a gravity environment. A report by RSC Energia shows that Kelly and Kornienko successfully completed all exercises which included different tasks such as standing up from a chair without the use of the hands, standing up from a lying position, standing upright on both legs for three minutes, stepping over obstacles, and walking in tandem with eyes closed. In total, the experiment session included 11 tests and will be repeated by the crew at different intervals to track their re-adaptation to Earth’s gravity. 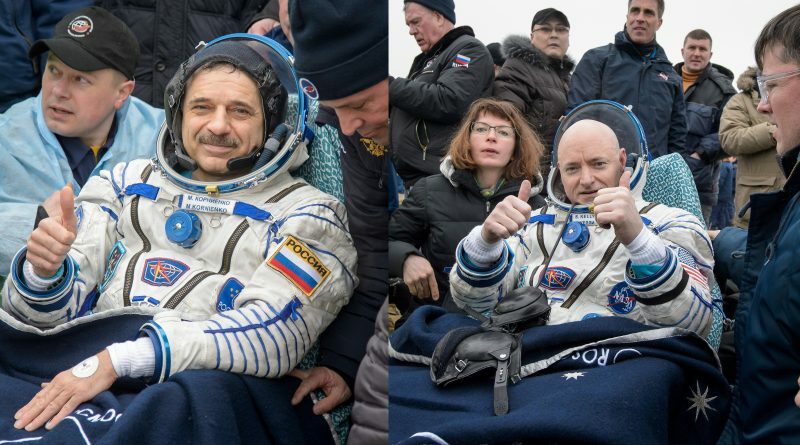 Having gone through the first experiments back on Terra Firma, the crew departed for Dzhezkazgan, close to their landing site where they were welcomed in a traditional ceremony before parting ways for the first time in a year – Scott Kelly boarded a NASA plane to Houston while Mikhail Kornienko and Sergei Volkov had a shorter trip, heading back to Star City. The two Russian crew members received a very warm welcome at their home base by fellow Cosmonauts and support personnel. For Kornienko, his return marked the immediate start of the Созвездие (Constellation) Experiment series comprised of different tests to simulate tasks a crew member would have to complete proficiently when landing on a distant target such as Mars after a lengthy transit from Earth. On Thursday, just one day after coming back from his yearlong stay in space, Kornienko was strapped into the ЦФ-7 centrifuge at the Cosmonaut Training Center to first complete a simulated manual descent without rotation of the centrifuge followed by a test run during which he was subjected to the forces typically occurring during atmospheric entry and descent to assess whether it was possible for him to control the craft, both from a physical and mental point of view. Being able to assess the abilities of crew members will help designers when putting together a mission to Mars with respect to tasks for the crew as part of the landing. A misjudgment of a human’s ability in a mission critical situation can have severe consequences and therefore confidence has to be gained through tests such as this that a crew member will be able to function and complete the tasks they are faced with. The second phase of experiment will be a simulated spacewalk using an Orlan DMA spacesuit suspended on lifting slings to simulate the crew member’s weight on the Martian surface and the planet’s reduced gravity of 0.38 Earth Gs. This exercise will be completed on the fourth day after landing with participation of Mikhail Kornienko who spent 11 months in space, Sergei Volkov after his 182-day mission and Aleksandr Misurkin who is currently training for an ISS mission – providing the opportunity of comparing the abilities of crew members after different stages of in-space degradation and no exposure to space at all. The EVA simulation will require the crew members to complete basic spacewalking tasks that would be a part of an EVA on Mars – starting with the opening of a spacecraft hatch, climbing down a ladder and different surface tasks, e.g. setting up experiment equipment, carrying components, handling tools and walking over obstacles in the bulky space suit. For Scott Kelly, the journey back to Houston was much longer and included stopovers along the way. These stops were used by medical personnel and scientists to continue some basic experiments with their returned Astronaut. Kelly shared on Twitter a photo of his first sunset seen on Earth during a stop in Norway and he received a congratulatory call from President Obama while en-route to Ellington Field. 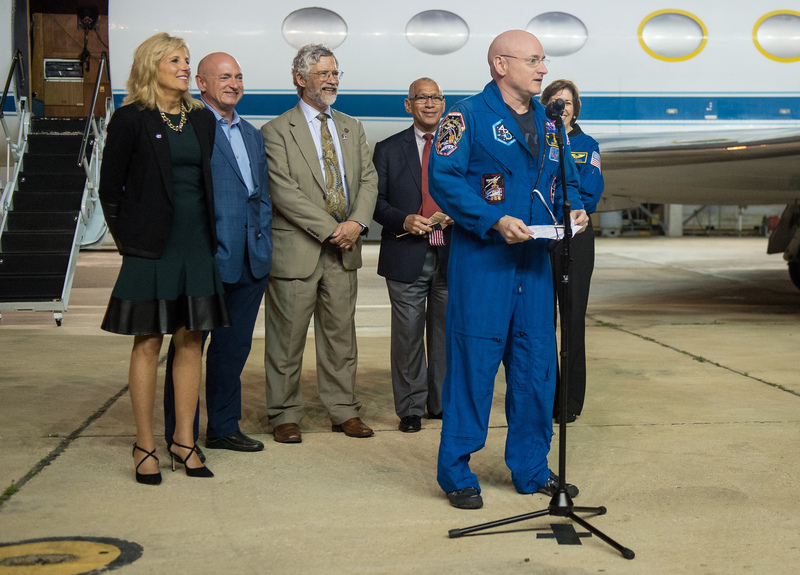 His plane landed in Houston after midnight local time and Kelly was welcomed back to the U.S. by NASA Administrator Charles Bolden, Scott’s twin brother Mark, Jill Biden, representing the vice president, and Obama’s science advisor John Holdren. On Thursday, Kelly shared a short video of him jumping into his swimming pool as he announced in the closing days of his flight to be one of the firsts things to do back on Earth. His first full day back was filled with plenty of experiments and sample collection, also involving his twin brother in the continuation of the Twins Study. For the first 45 days, the returned crew members will undergo daily experiment and rehab sessions as well as debriefings while memories of their flights are still fresh. Science data collection is expected to continue for the next year, three years for some of the studies looking at the long-term effects of the space environment. 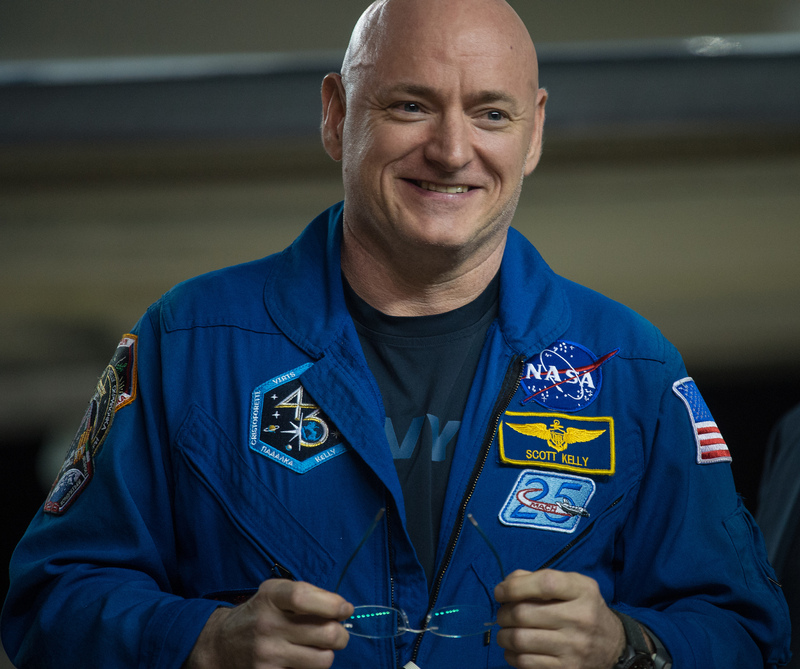 Scott Kelly does not expect to return to the Space Station, having spent 520 days in space on four missions, now ranking 17th on the all-time list. 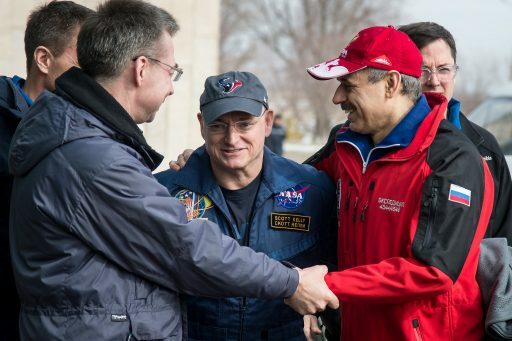 Although he is unlikely to fly again, Kelly hopes to stay involved in the space program and support ongoing activities in one capacity or another.